Hedge funds are not perfect. They have their bad picks just like everyone else. Facebook, a stock hedge funds have loved, lost nearly 40% of its value at one point in 2018. Although hedge funds are not perfect, their consensus picks do deliver solid returns, however. Our data show the top 15 S&P 500 stocks among hedge funds at the end of December 2018 yielded an average return of 19.7% year-to-date, vs. a gain of 13.1% for the S&P 500 Index. Because hedge funds have a lot of resources and their consensus picks do well, we pay attention to what they think. In this article, we analyze what the elite funds think of Keysight Technologies Inc (NYSE:KEYS). Keysight Technologies Inc (NYSE:KEYS) investors should pay attention to an increase in enthusiasm from smart money lately. 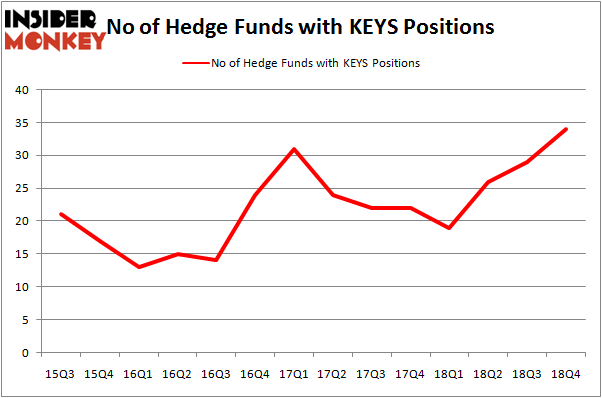 Our calculations also showed that KEYS isn’t among the 30 most popular stocks among hedge funds. We’re going to analyze the fresh hedge fund action encompassing Keysight Technologies Inc (NYSE:KEYS). How have hedgies been trading Keysight Technologies Inc (NYSE:KEYS)? At the end of the fourth quarter, a total of 34 of the hedge funds tracked by Insider Monkey were bullish on this stock, a change of 17% from the previous quarter. By comparison, 19 hedge funds held shares or bullish call options in KEYS a year ago. So, let’s find out which hedge funds were among the top holders of the stock and which hedge funds were making big moves. Among these funds, Ariel Investments held the most valuable stake in Keysight Technologies Inc (NYSE:KEYS), which was worth $142.5 million at the end of the third quarter. On the second spot was AQR Capital Management which amassed $113.8 million worth of shares. Moreover, Millennium Management, Balyasny Asset Management, and Renaissance Technologies were also bullish on Keysight Technologies Inc (NYSE:KEYS), allocating a large percentage of their portfolios to this stock. With a general bullishness amongst the heavyweights, key hedge funds were leading the bulls’ herd. Balyasny Asset Management, managed by Dmitry Balyasny, established the largest call position in Keysight Technologies Inc (NYSE:KEYS). Balyasny Asset Management had $52.8 million invested in the company at the end of the quarter. Bruce Garelick’s Garelick Capital Partners also initiated a $18.6 million position during the quarter. The other funds with brand new KEYS positions are Phill Gross and Robert Atchinson’s Adage Capital Management, David Costen Haley’s HBK Investments, and Joe DiMenna’s ZWEIG DIMENNA PARTNERS. Let’s check out hedge fund activity in other stocks similar to Keysight Technologies Inc (NYSE:KEYS). We will take a look at Gartner Inc (NYSE:IT), C.H. Robinson Worldwide, Inc. (NASDAQ:CHRW), Elanco Animal Health Incorporated (NYSE:ELAN), and NRG Energy Inc (NYSE:NRG). This group of stocks’ market caps are closest to KEYS’s market cap. As you can see these stocks had an average of 28.75 hedge funds with bullish positions and the average amount invested in these stocks was $904 million. That figure was $698 million in KEYS’s case. NRG Energy Inc (NYSE:NRG) is the most popular stock in this table. On the other hand Elanco Animal Health Incorporated (NYSE:ELAN) is the least popular one with only 18 bullish hedge fund positions. Keysight Technologies Inc (NYSE:KEYS) is not the most popular stock in this group but hedge fund interest is still above average. This is a slightly positive signal but we’d rather spend our time researching stocks that hedge funds are piling on. Our calculations showed that top 15 most popular stocks among hedge funds returned 19.7% through March 15th and outperformed the S&P 500 ETF (SPY) by 6.6 percentage points. Hedge funds were also right about betting on KEYS as the stock returned 38.4% and outperformed the market as well. You can see the entire list of these shrewd hedge funds here. Were Hedge Funds Right About Flocking Into MSCI Inc (MSCI) ? Did Hedge Funds Drop The Ball On Lennar Corporation (LEN) ? 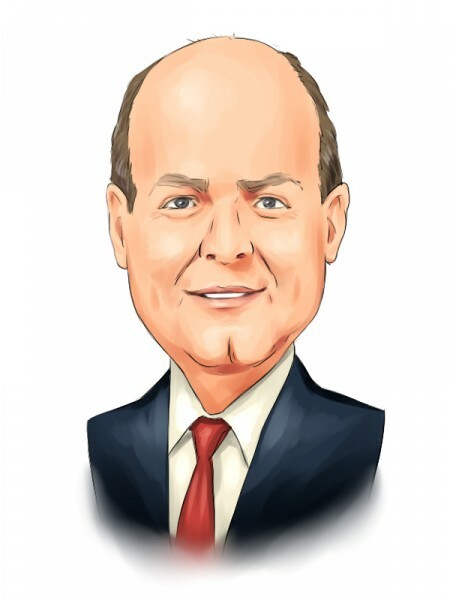 Here’s What Hedge Funds Think About Discovery, Inc. (DISCA) Here’s What Hedge Funds Think About Annaly Capital Management, Inc. (... Here’s What Hedge Funds Think About D.R. Horton, Inc. (DHI) Did Hedge Funds Drop The Ball On Veeva Systems Inc (VEEV) ?